These are the french fries of the tea partying world. The edges are crisp while the center is chewy version of shortbread I had no idea existed! Maybe I under-baked them a smidgen, and maybe I’m so glad I did! 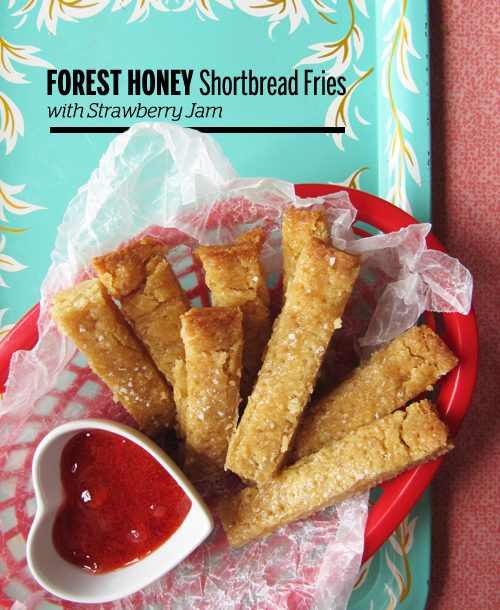 These are dreamy with forest honey, sea salt, and jam. Pretty much three of my faves. So, I think you should totally make these little fellas for your next lady party. Use your most favorite honey. Package them up like french fries in little paper bags, if you’re feeling ambitious. 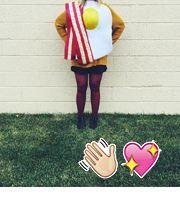 But mostly, let’s just get our french fry on cookie style. Preheat your oven to 350F. Spray an 8×8 inch baking dish with cooking spray. Line with parchment paper and spray again. 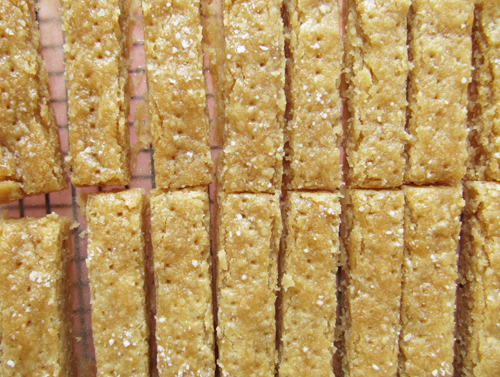 With an electric mixer, beat together the shortbread ingredients on low until combined, well-mixed, and smooth. Press into the prepared baking dish. Prick with a fork all over, being careful not to press the fork all the way to the bottom of the pan. Bake for 35-40 minutes or until the center of the cookies feel firm when lightly pressed and are golden brown all over. Allow to cool in the pan for 5 minutes. 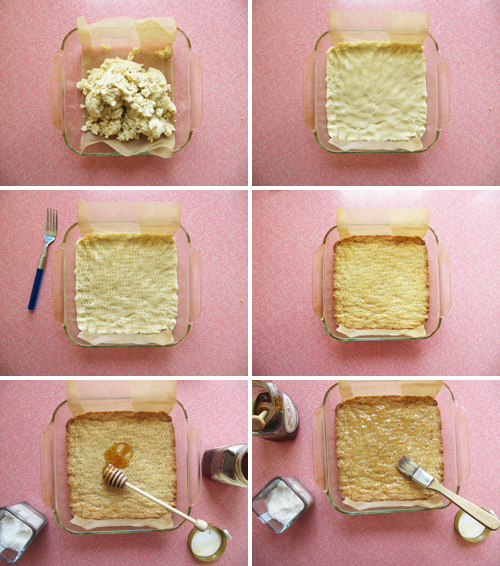 Brush the additional tablespoon of honey over the shortbread and sprinkle with sea salt. Allow to cool in the pan for 30 more minutes. Cut with a sharp knife and allow to cool completely on a wire rack. Serve with jam or more honey for dunking, and a cup of tea if you’re feeling especially ladylike. Click HERE for a printable pdf of the recipe above. Honey, thanks for being you. Cute, tasty and lovely pictures!! 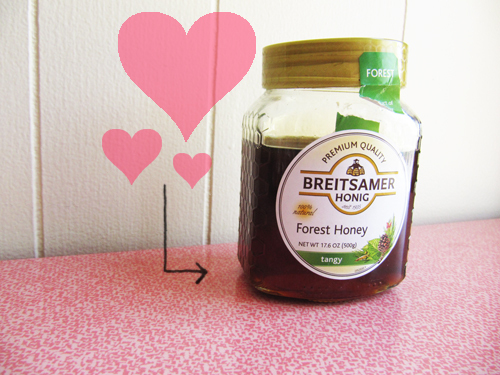 I love that you have forest honey! And, I just want all the fries in the world, way to make them happen in a cookie! Yeah girl! Let’s eat french fry pizza soon. These are super cute. They would be great for a party! Forest honey!? Sounds delicious and magical, like it was gathered by tiny gnome hands! These must be the best fries ever. French fries in sweet form! Holy moly. I love! These sound all kinds of awesome! 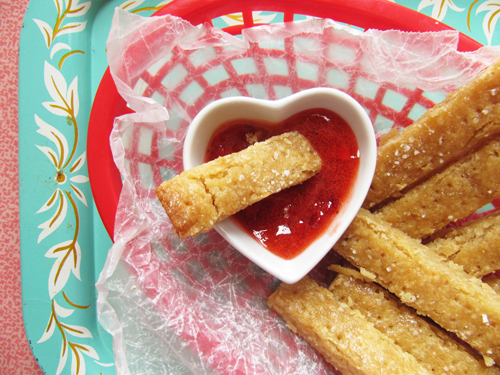 Love your little heart dish of jam, too. Oooh gurl, you’d love these, I bet! Dude!! Major awesome! Bonkers! Incredible! More superlatives… Can’t wrap my head around this! Yum! These look so good, and I love the presentation. I’ll have to check out that forest honey – I just used the rest of mine up last night. Thanks, Sidney! I can’t get enough honey in my life. Thanks Jenny! 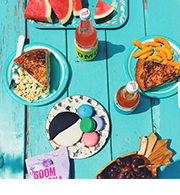 Nothing quite like snacking with a hottie, right? Can we say DELISH! This recipe will definitely be added to the collection. I audibly whimpered when I saw your goat cheese & blueberry tart recipe, and by the time I got to this post, I started to panic when I couldn’t find the RSS feed button. Could not subscribe fast enough. Next post: Sweet & Savory Crepes with Wisconsin Cheese + A Giveaway!